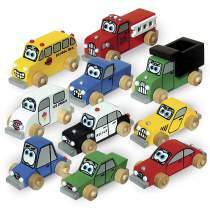 Ten irrisistibly cute cartoon vehicles in miniature! Easy construction from 1-1/2" lumber. They measure from approximately 4-3/8" long to 6-1/2" long. Order 20 eyes, 40 Grooved Wheels, 40 AP1 axle pegs and 60 AP6 Axle Pegs separately below.